Happy Easter!!! Jesus is a live!! I hope you’re looking forward to celebrating this wonderful event today!! You made it through all 35 days. I hope you have been blessed by this time. I pray you’ve been brought closer to God and each other. I certainly have! Do you know I’ve written in the last month over 20,000 words!! That’s the equivalent of two-degree dissertations!!! Buts its been wonderful I’ve loved sharing my heart about God with you and all his plans. I don’t know about you, but often later God gives me a telling off! God asked me why I had such low expectations of Him when He is the God of the universe!! God asked me why I trusted him so little when He had done so much in the past. God reminded me that He was a good father and he loved giving good things to His children. God said why don’t you write down all the things you’d love to see me do in this Church and Blackburn. A Newfrontiers Impact student being developed within our church http://www.impact-training.org.uk/ and us sending our young people to other churches as impact students. For love to abound more and more in our church. Ministry in old people’s homes. prayer, services sharing the Gospel, administering communion etc.. Vibrant presence filled prayer meetings to grow and develop. Developing new leaders in our church and sending them to ChristCentral leadership training in Sheffield. For Community Church Blackburn to have a deep prayer life. Evangelistic Testimony nights running monthly at Wesley Hall. Having to have baptism services much more than once a year because to many people want to get baptised!! To watch all our youth and children develop an strong faith in Jesus. More love and cooperation between churches in Blackburn. A Christian running club or fitness club. Pretty shocking isn’t it. I was quite scared. After scripture, as a church, we need to be primarily guided by the Holy Spirit and the Prophetic and a lot of those things God may, or may never allow us to do. However, we’ve got a big God!! Why can’t he do those things? We need to develop a big faith because we’ve got a big, big God who is good and who loves his people to step out in faith. That’s why we pray because who wants us I believe to ask Him for stuff!! Lets as a church dream big for His Glory. To see His Kingdom come in Blackburn and in oue church just like it is in heaven. Are you excited about what God can do? I am! I hope you are to! We’re very near the end of this season and today God put on our heart to pray for repentance. Briefly defined, repentance is turning away from sin and self and looking to God for forgiveness and salvation. The Old Testament uses the word “turn” or “turning” to describe repentance. Those who repent turn their backs on their sin and come around to seek God; repentance is the conviction of guilt before God and the awareness that we are stained and in need of cleansing. This isn’t something we do, but it is something God works in us. Why repentance today Well I think unrepentance can work against all God’s blessing, will and good things that he has planned for us both Individually and corporately. Do you need to repent or deal with some unforgiveness or sin in your life today? Be honest about your need for repentance. Repentance requires honesty. No one comes to God with true repentance in their heart unless they’ve first acknowledged their need for forgiveness and reconciliation with him. Only those who have ceased trying to cover up their sin with self-righteousness and deceit can experience the deep and lasting change that comes only through repentance. Acknowledge the danger of sin and damage of guilt. Let’s face it: you are seeking repentance because God’s Spirit has convicted you. We often blame others for our stress and general moodiness, but many times we simply feel bad because we’ve done bad things. King David describes physical and emotional symptoms associated with a guilty conscience. We must honestly assess the consequences of our sin, which means assessing both personal consequences and the impact it has had—and will continue to have—on others. Deep repentance demands full confession. Though it seems counterintuitive, the only way to be truly covered by Christ is to fully expose your sin. In the process of repentance, we must fight to be utterly transparent before God about the depth and breadth of our sin. Only ruthless honesty will suffice—and lead to freedom and joy. Adam and Eve hid behind inadequate, self-made coverings to mask their sin and shame. We too often hide behind self-made righteousness in order to make ourselves appear more acceptable than we really are. If you want to change, to really change—which, by the way, is the mark of true repentance—then you must hide in God alone. It’s not enough just to repent of overt sins. It’s not enough to say, “I admit to my wrong behaviours.” All kinds of people repent that way, especially religious people with an image to maintain. A Christian doesn’t just repent of their outward sins, but also of their attempts to hide behind shoddy self-made righteousness. Stop hiding in your effort. Hide in God. Use today to pray it through. Pray through about repentance today. I promise God will not let you down. Being a Christian is hard and if your searching out an easy life with no problems Christianity is not going to achieve this. If anything, being a Christian produces more problems than you may of had before. None of the early church, or Apostles in the bible had an easy life! If the Apostle Paul wanted an easy life he could have stayed as a Pharisee, far more straight forward. The early church, as the church is in many counties today, was severely persecuted. They were burnt, hung, stoned, crucified, fed to lions, had the head chopped off the list continues. Today Christianity is the most persecuted religion in the world fact! With Christians facing some form of persecution in at least 144 countries today. Please pray for our persecuted brothers and sisters in Christ and thank God that we are able to worship in peace in this country. Someone once said that the Christian life is not spent on a cruise ship, you are saved onto a battle ship as you’re in a spiritual war. If you come to faith in Jesus it’s very likely Satan is going to start dropping spiritual bombs on you. If this is the case, why would anyone in the right mind choose to be a follower of Christ? I had another Grandma who was a wonderful Christian lady who had a really, really tough life but her favourite hymn was this, which I remember her singing to me as a child. Christ won’t stop all your problems, but he is the answer to all your problems He is your anchor, and he fills you with His Holy Spirit to give you love, joy ,peace, patience and endurance through all the storms of life. Often when we pray, we ask God to take away all our difficulties in life, but that’s not what we see in scripture. We see the church praying that they would be given more patience and endurance to persevere in their difficulties. It’s a challenging thought! Pray today for patience and endurance through the storms of life. Thank Jesus for being with you in the trials. Ask God to fill you with His Holy Spirit for more patience, endurance and perseverance. Consider it pure joy, my brothers and sisters, whenever you face trials of many kinds, 3 because you know that the testing of your faith produces perseverance. This was my Grandmas favourite Hymn. My Grandma had quite a tough time through her life particularly towards the end as she struggled with large amounts of pain. But I know she loved Jesus and she lived a thankful life! Why because she regularly counted her blessings. Do you know what it sounds harsh but God doesn’t owe us anything! In fact if we got what we deserved from God it would be very bad! We have no rights before God and everything in life had been given to you by His grace which is underserved favour. This make us more thankful for what we have in the little things. Today spend a bit of time thanking God for the many, many blessings in your life. We are to be defined as a thankful people as Christ Followers even in the little things! If you’re reading this eating toast and drinking coffee even in those small things you have so much to be thankful for. Its really tough being a teacher and working in a school. I didn’t know this until I married a teacher!! Work with children in schools is so important to our communities as a whole and they do an amazing Job. Please pray for all the people who work in the education sector, in our church, today. 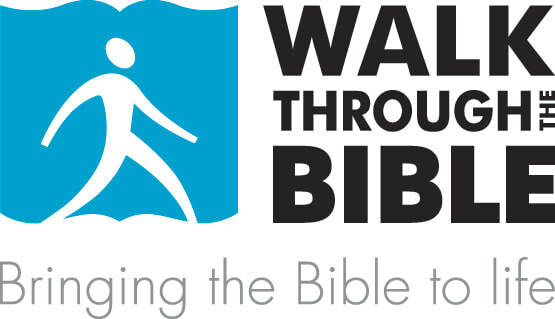 I specifically want to pray for Christiana and the work she does with Walk through the Bible/Bible Explorer. If you don’t know what it is have a look here it is awesome! https://www.bible.org.uk/index.php. Basically Christiana goes into Schools and teaches children the large sweep of the story in the bible. This is incredible work and sowing seed after seed of the Kingdom of God. Go hunt Christiana down and ask her about it. Do you know that there is a large waiting list of schools wanting someone from Bible explorer to come. This is basically a wide open invite to preach the Gospel in Schools!. The fields really are ripe for harvest be the workers are few. Please pray for Bible explore and Christiana’s. Please pray that they have enough worker to fulfill all the schools that want them to do it. Please also thank God for their work, which is amazing. Ultimately great areas of opportunity to sow seeds of the Kingdom of God is in Schools. In areas such as afternoon clubs, home work clubs the list and the opportunity are endless. All is possible if we have faith as large as a mustard seed. When we ask a God of Ultimate provision! Moses was educated in all the wisdom of the Egyptians and was powerful in speech and action. Day 28: Sunday 14th April pray for our work places. In churches we don’t talk about I normal work very much. Often we can give the impression about life that Sunday is our spiritual life (which is really important and the main event) and the rest of the day God doesn’t intrude on that. Well that’s not True!! Missionary, evangelist, apostle, church pastor, church youth worker, christian charity worker, doctor, nurse, teacher, manager, carer, Business man, banker, taxi driver. That not true at all!!! God would take a faithful taxi driver any day over an unfaithful missionary. God is very, very interested in our work places. Think of your work as your worship. God is glorified when you are a good employee as it's Him you ultimately work for. Christians should be the best employees!!! If truth be said, this is the hardest place to live out our faith. Being a Christian in church is easy! Being a Christian in your work place is hard. We spend often at least often 40 hours a week at work living all that time for God is a tough call!! It is tough and that why we need the Holy Spirit to get us through. Today pray for your workplace that God will fill you with His Holy Spirit so you Glorify Him more and more. Pray for your co workers – even the ones you don’t like, even the managers that don’t know what they are doing and aren’t very good!! Don’t pray that God will change them! Pray that God will change you first! Pray that through the Holy Spirit you are able to patiently endure in the work place. Remember that things won’t always go the way you want it to at work. This is due to the fall and the thorns in the field talked about early in Genesis. Pray for more of the fruits of the spirit in you, in your work place. Remember you work is your worship! God saw all that he had made, and it was very good. And there was evening, and there was morning the sixth day. In November 2016 we launched, in faith, Healing on the streets Blackburn. It was a miracle that we managed it at all, and God stepped, was so faithful and provided in so many ways. If you want to hear the story come and talk to me. We had Mark Marx come in person and teach us how to do it however, interestingly, it was less about method and more about who we are in Christ! I must admit that I was very scared. If you would have asked me would I be going out on the streets of Blackburn, publicly praying for people I would told you that you’re mad! I’m also always extremely surprised how many people get prayed for in Blackburn. There is a real spiritual hunger in the is town, and in this nation and normal people are hungry for God. For years the church has seemed to be tentative and apologetic about its faith, but I really believe that people are hungry for God and revival is imminent! I also think that there is an indirect/direct link between growth in the Kingdom of God and church. It’s what I call God economy, which is where we step out in faith in one place. God often honours that in another. Its not an exact science, but on the weeks the HOTS team goes out it seems to have a growing, positive spiritual effect on our Sunday mornings. Keep watch and see what you think? Its always a blessing when the team go out of the streets even through wind and rain and we’ve seen literally lives changed healings and miracles. 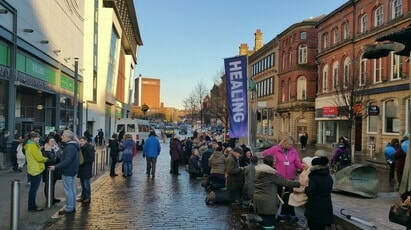 In fact, one of the people who we baptised at our church last September had part of his Journey and connection with the church take place through Healing on the streets. Recently we’ve gone to going out on the streets every other week however, the more often we go out the more impact for Gods kingdom we will have. Please pray for a bigger vision for HOTS! Please pray for the HOTS team led by Geoff Dent and Carole B. Please make them bold and faithful and wise as they lead. Please pray for more churches to be involved as the more we act as one church in Blackburn, the more God is Glorified. Please pray for growth in the teams the more people who go out the more people can be prayed for. Please pray for more and more lives changed, made new, more miracles and healings. Finally, if you’re not involved in HOTS it’s amazing and not as scary as you think. There’s no obligation to do every week and I know you will be blessed. Jesus saw the huge crowd as he stepped from the boat, and he had compassion on them and healed their sick.